GORHAM, ME - The 2013 Maine 2 Meter FM Simplex Challenge takes place Sunday, February 10th, and runs for 4 hours, beginning at 2:00PM local time (1900 UTC). Contacts, as always, are limited to FM Simplex on the 2 meter band. Participants may be entered as either fixed or mobile, but not as both. The exchange identifies your location and the power level you're running. See the complete rules for details. If you've participated in previous years, please review the 2013 rules, as there's been changes made in the power level exhanges and clarifications to the mobile category, to keep the contest as competitive as possible. Certificates will be awarded to the winner in each category as well as overall. 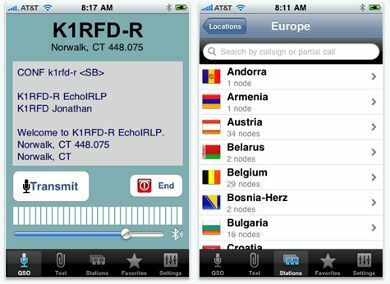 The Echolink app for iPhone, and Android phones and tablets provides access to the Echolink network for validated Echolink users. Now, you can connect to the Echolink system from almost anywhere, using your smartphone or tablet. 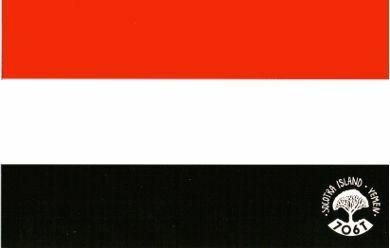 Here's an interesting QSL card from Socotra Island, Yemen, from the Spring 2012 DXpedition to the island. (Contact made by W1WMG on 20 meters SSB). At January's club meeting, we began our latest project, which is a simple device that can be used with any handheld or mobile transciever to send modulated CW. It is basically an audio oscillator and keying circuit which acts as an interface between a CW key and a radio. Modulated CW is nothing more than audio tones keyed on and off and fed to your transceiver's audio jack. The circuit design, including speaker and 9V battery are small enough to fit inside an Altoids tin, or similar enclosure, so it can easily put in your pocket or stowed with your HT. Click the link below for more information, including schematics, a circuit diagram, and parts list, courtesy of Roger Pience, N1XP. If you're interested in purchasing a kit, with all the necessary parts to build the project, click here. SAN JOSE, Calif. - It was a rainy weekend in San Jose, but all indications were that the weather would be clear in the afternoon on Sunday, December 2nd, 2012. Almost 1 year ago, on December 11th, 2011, a latex baloon, CNSP-11, was launched from San Jose, California, and traveled across the United States, the Atlantic Ocean, Portugal, and Spain. The baloon burst at 115K' above the Mediterranean Sea and fell into the sea off the coast of Algeria. The Wireless Society of Southern Maine would like to welcome new members: Troy Dennen, NW1B, and Corey Dennen, of Scarborough, ME, as well as Ryan Michaelson, KB1YTR, of Westbrook, ME. 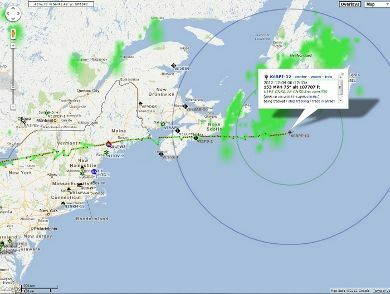 Recently, during my travels to Western Massachusetts, I clicked on my 2 meter HT and began the task of programming area repeaters. This usually involves either flipping through the well worn pages of my repeater directory, or checking online via my phone for the latest tones and offsets. Suddenly I found myself asking a question: "Why can't my HT just connect to a network and automatically download, based on my location, the necessary information?" Could it be due to economic factors, or that still lingering fear that communications via the internet just isn't radio? It certainly is not because it is very difficult to acomplish. Just look around and you'll see that today's gadgets -most of which are cheaply produced - are an integration of many technologies, including micro controllers and embedded designs. Simply put, if a book reader or an mp3 player can connect to a WiFi network and allow the device to surf, update, and interact, then so should my radio. Although, in some respects hams have embraced these technologies, including the internet for things like VoIP, and sending simple information, or as a reference when its used to spot DX or lookup call signs, there seems to be a reluctance among manufacturers and individuals to truly integrate its capabilities with the amateur medium. 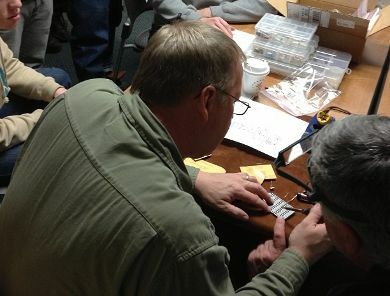 Amateur radio has always had a sort of pioneering nature - one of development and innovation, regardless of the challenge, but lately it seems destined to follow at the heels of commercial development, instead of leading the way. A good amateur station, throughout history, has been one that practices the state of the art. But can we honestly say that we have that now? That our personal stations are state of the art? Look at your HT or even your HF rig.Is there anything new or innovative about it? There are a few exceptions - those who are exploring software defined transceivers, and the possibility of networking them with each other - or of using small amounts of power and spectrum to transmit data, but these are still just first steps toward utilyzing all that's available to us. The future may be one in which radios can do more than just transmit and receive audio or digital modes, but will "interact" with each other. Then again, it could stay where it is, on the threshold of something truly exciting. The part that is not certain is the future status of amateur radio. It will be what we make it. What happened to the dream that one day amateurs would be able to see each other as well as talk to each other? What about that 2 meter contact across the Atlantic? Have we given up on these challenges? It was famously written in Clinton DeSoto's 200 Meters Down: "But of course, we are prone to say, you and I, in our smug complacency, there's nothing too all that. There's nothing more to do but a little gossiping, a little dabbling. Nothing new, nothing important. Have we truly reached the ultimate... in 1936?" Acknowledgments: Ferguson, Don. "Launch of CNSP-18 Transatlantic / Transcontinental Ballon Flight." Press Release. California Near Space Project. DeSoto, Clinton. "200 Meters Down" ARRL Publishing. Newington, CT.